As described above, several possible neural mechanisms exist to correct for minor eye displacements. These mechanisms, when combined with voluntary and reflexive eye and head movements in a conscious subject, pose problems for measuring eye movements due to masticatory muscle contractions. We attempted to circumvent these difficulties by measuring eye movements in anesthetized subjects. The Institutional Animal Care and Use Committee at Stony Brook University approved animal procedures. The magnitudes of eye movements that anterior temporalis and medial pterygoid are able to cause were measured in one Otolemur, and three Felis subjects sedated with intramuscular injections of ketamine and acepromazine, then anesthetized with inhalant isoflurene. 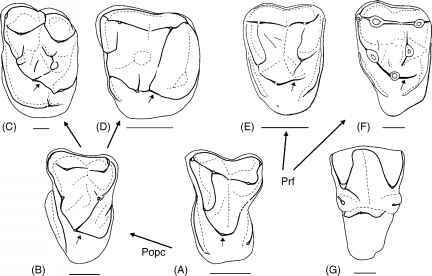 Two of the Felis subjects had postorbital processes and short postorbital ligaments, and one had bilaterally complete postorbital bars, as verified by radiographs. Two small incisions (approximately 1-1.5 cm) were made, one in the infraorbital region and one above the center of the orbit. Small markers (consisting of flat-based metal posts) were glued onto the bone with cyanoacrylate adhesive. A high contrast cotton marker was applied to the cornea and sclera. The purpose of the scleral/corneal and bone markers was to allow calculation of eye displacement due to masticatory muscle contraction while simultaneously subtracting ancillary head movements. Indwelling bipolar fine-wire EMG electrodes were inserted into the anterior temporalis and medial pterygoid muscles, and connected to a stimulator. These electrodes consisted of two nickel-chromium alloy fine wires (0.05 mm diameter) with the insulation stripped off at the tips, and fed through a 25-gauge hypodermic needle. Two Sony DCR-PC110 high-resolution megapixel digital camcorders equipped with 120x zoom lenses were used to videotape eye movement. The lenses of the two cameras were positioned parallel and perpendicular to the orbital plane, respectively, in order to quantify mediolateral displacement or rotation and protrusion of the eye during muscle stimulation. The parallel camera was positioned anterolaterally to "face" the eye, and the perpendicular camera was positioned superiorly. We present data on movements of the eyeball marker, parallel and perpendicular to the orbital plane. A grid with 1 mm increments was placed within the plane of the tips of the bone and eye markers and videotaped for calibration. At the full macro option, much of the eye and orbit filled the screen. The anterior temporalis and medial pterygoid muscles were stimulated by applying currents (250-450 || amp at 50 Hz) through the electrodes (Stern and Susman, 1981; Susman et al., 1982). Muscles were stimulated individually to tetanic contraction and the eye movements were recorded on digital videotape. Eye movement data were analyzed by playing the videotape and capturing images of the calibration grid and of the eye both before and during the muscle stimulation. The video images were imported into SigmaScan Image Measurement Software (Jandel Scientific Software, San Rafael, CA). The calibration grid was used to scale measurements. Resolution was evaluated by measuring known distances and was determined to be 2.0 x 10-2 mm/pixel. Eye movement was measured by drawing calibration lines on the images between the two bone markers and measuring the linear distances between these lines and the marker on the eyeball. These linear distances, after calibration for each camera, were used to compute the translation of the eye markers parallel and perpendicular to the orbital plane relative to the orbital markers. Note that linear motion will be less than an arc motion, and in the cases of rotation of the eye, may underestimate the amount of movement generated.